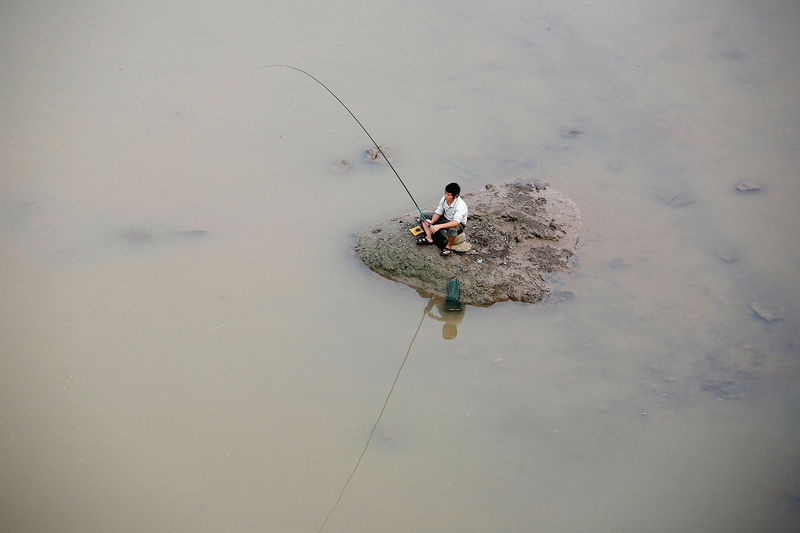 A man fishes on a small island at the Jialing River in Chongqing Municipality, November 2, 2006. This article by William J. Schulte and Li Haitang was first published on Chinadialogue. Friends of Nature, a Beijing-based non-governmental organization (NGO), filed two landmark cases against a local Environmental Protection Bureau in Yunnan this year that have revealed the current limits of one of the most hopeful provisions in China’s recently-amended Environmental Protection Law. The first major amendments to China’s Environmental Protection Law (EPL) in 25 years permitted NGOs to bring environmental public interest lawsuits, or “citizen suits” for the first time, and took effect on January 1, 2015. It was a watershed moment in the development of China’s environmental governance system. The new law empowered NGOs to file public interest lawsuits against polluting enterprises. Previously, NGOs were limited to seeking monetary damages for personal injury to individuals in environmental cases. But it remained unclear what would happen if an NGO brought a case against a government entity. Specifically, would it be able to bring a case against the conduct of an agency? Such cases have played a major role in improving environmental governance elsewhere in the world by allowing citizens to hold government accountable. Is China ready for these so-called “administrative” lawsuits? Friends of Nature filed two administrative public interest cases against a local Environmental Protection Bureau in Yunnan province. They concerned the building of a potassium perchlorate manufacturing plant in the exceptionally bio-diverse Nujiang region, and the way in which the local EPB approved the plant’s environmental impact assessment (EIA). Fugong Qunsheng Electric Salt Technology Co., Ltd began construction without approval in July 2014. The Nujiang region lies within the “Three Parallel Rivers of Yunnan Protected Area,” a region of mountains and forests that UNESCO believes may “harbor the richest biodiversity among temperate areas in the world.” In 2004, Premier Wen Jiabao famously postponed a cascade of hydropower dams on the Nujiang river due to environmental concerns. Fugong Qunsheng Electric Salt Technology Co., Ltd. commenced construction of its plant in July 2014 without an EIA approval. Members of the Lisu minority live close to Fugong Qunsheng’s site. Potassium perchlorate is a volatile chemical, used mainly in manufacturing fireworks, matches, and explosives. Its production generates dangerous by-products including carcinogenic hexavalent chromium. There is no disposal facility for hexavalent chromium nearer than Kunming, the provincial capital, 680 kilometres away. Transporting it there means a high risk of accidental spills, with devastating consequences. What’s more, villagers in recently built Wangnian live a mere 115 metres from the plant, squarely within its potential blast zone. China’s laws stipulate that an EIA must be carried out for all construction projects, and approval obtained before work starts. Nujiang EPB publicized the firm’s late EIA report for public comments on March 31, 2015. On April 23, the EPB published notice of its intention to approve the report and project. On May 4, 2015 the Nujiang EPB issued an order stating that Fugong Qunsheng had violated the 2002 Environmental Impact Assessment Law by building prior to obtaining approval. It imposed an administrative penalty of 50,000 yuan ($7,460) on Fugong Qunsheng, ordering it to halt construction and apply for EIA approval before May 30. Four days later, the EPB issued an approval of the plant’s EIA Report. Friends of Nature sought to have the court nullify this approval as it was issued in violation of China’s amended Environmental Protection Law. Nujiang EPB had seemed to follow procedural requirements under the 2002 EIA Law, but the Ministry of Environmental Protection has made clear that local EPB’s should apply the newly-amended Environmental Protection Law’s requirements. Friends of Nature argued that Nujiang EPB acted illegally in following superseded procedures, and approving the resubmitted EIA report in this way. Friends of Nature first attempted to raise these issues with Nujiang EPB over several months, but got no response. Finally, on December 19, 2016 the organization filed the two administrative public interest lawsuits, requesting the court revoke the EIA approval and administrative penalty. Lushui County People’s Court accepted the cases on January 3, 2017, and issued its dismissal decision on May 31, saying that Administrative Litigation Law did not authorize the NGO to bring the suit. Administrative law generally refers to the body of legal requirements and procedures that apply to government actions, such as the review and approval of EIA reports. Administrative litigation is that taken against a government for taking (or failing to take) an action. China’s well-established Administrative Litigation Law authorizes filing administrative complaints by “citzen[s], legal person[s], or any other organizations” when government action has infringed in a direct way upon their own rights or interests. It has been widely used. A 2015 study of judicial decisions on Environmental Impact Assessment Law found 45 of 107 cases on Beijing University’s database were brought by “interested parties” such as local residents or village groups, living near the project under review. Cases were permitted to move forward because the plaintiffs were directly impacted by the local authorities’ decisions. Another, recent example of an “interested party” case comes from Shenzhen: in December 2016 the Shenzhen Intermediate Peoples’ Court ruled in favor of a local citizens’ group that brought an administrative lawsuit against the local government for procedural violations of the 2002 EIA law. The group were residents living close to the site of the proposed waste incinerator. However, China’s Administrative Litigation Law has never been interpreted to permit NGOs to pursue administrative litigation for actions alleged to have infringed the public interest—as opposed to actions involving direct individual interests. The 2014 amendments to the EPL authorizing NGOs to bring environmental public interest litigation have therefore been interpreted as being limited to civil disputes directly against polluters—in other words, lawsuits against polluters for damaging the environment. Administrative litigation against government agencies can be a very powerful tool to incentivize government agencies to implement environmental laws properly. Given prosecutors have limited resources, NGOs can provide additional pressure. In a famous US case from 1971, Calvert Cliffs Coordinating Committee v US Atomic Energy Commission, local environmentalists successfully sued the Atomic Energy Commission. The case had a lasting impact on how federal agencies treat EIAs within the decision-making process. Such cases can have greater impact on environmental governance than “citizen suits” against individual polluters, precisely because they promote sweeping changes in government actions. China is taking some steps in this direction. In July 2015, the Standing Committee of the National People’s Congress (NPC) implemented a pilot program authorising local prosecutors in 13 jurisdictions to bring administrative public interest cases against government agencies. The Supreme People’s Procurate subsequently issued “Implementing Measures” to guide prosecutors bringing such cases, leading to some positive results. In Guizhou, a prosecutor won a lawsuit against the local EPB for failure to bring enforcement actions against a corporate polluter. And in June 2016, a prosecutor in Shandong won a case against the local EPB for allowing a chemical firm to begin trial operations illegally, according to the China Daily newspaper. The NPC’s pilot program was enshrined in law in 2017 through amendments to Administrative Litigation Law’s Article 25—meaning that prosecutors across the country can bring administrative public interest cases. But the revision leaves out NGOs such as Friends of Nature. This omission and the failure of Friends of Nature’s cases against Nujiang EPB suggest that China’s central government is not ready to empower NGOs to hold government agencies accountable for legal violations. This will be an important topic to watch because developments will shape China’s environmental public interest litigation system. China’s legislators would do well to consider the crucial role that NGOs could play in supplementing prosecutors’ efforts to make sure that no government agency is above the law.